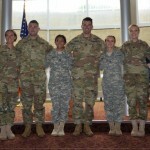 The Midwestern University College of Dental Medicine-IL Commissioning Ceremony for the newly graduated dentists entering the military services took place on May 20, 2016. 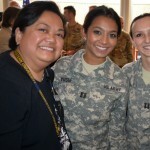 Four of the doctors joined the U.S. Army and two joined the Illinois Army National Guard. Dr. Brittany Howell, Dr. Alisha Nichols, Dr. James Kearns, Dr. Barbara Wegiel, Dr. Nicholas Wyatt and Dr. Sana Yusuf accepted their commissions in the ceremony. Dr. Larry William, Captain, Dental Corps, US Navy, Retired and faculty at MWU presided over the ceremony and administered the Oath of Office. 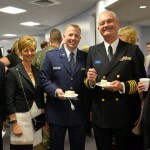 Dr. Brian Danielawicz, Lieutenant Colonel, Air Force and faculty at MWU was also at the ceremony. 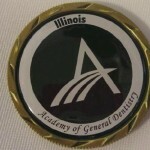 The IL AGD, represented by Dr. Cheryl Mora, presented each of the new officers with a “Challenge Coin” with the IL AGD logo on one side of the coin and the three branches of the military on the other side. The coin or medallion bears an organizations logo or emblem and is carried by the organization’s members. Traditionally, they are given to prove membership when challenged and to enhance morale. Dr. Williams explained the challenge, which can be made at any time, begins with the challenger drawing his/her coin, and slapping or placing the coin on the table or bar. Everyone being challenged must immediately produce the coin for their organization and anyone failing to do so must buy a round of drinks for the challenger and everyone else who has their challenge coin. However, should everyone challenged be able to produce their coin, the challenger must buy a round of drinks for the group. It is an honor for the IL AGD to congratulate these new officers and their families on their graduation from dental school and on their dedication and service to our country.